Someone who is opening an online store may feel a little nervous about choosing and registering a domain name. The person knows the importance of having the right domain name and wants to give it the proper amount of thought. However, he or she has no experience with trying to buy domain names and is not unsure of how to start the process. If you are a new online store owner who is trying to decide on a domain name you may want to keep these three things in mind. These three suggestions can help you to end up with a domain name that contributes to the success of your store. The first thing that most online shoppers do when they are looking for a product or service is to conduct an Internet search. They may scan the first or even the second page of search results to find an online store that looks promising. 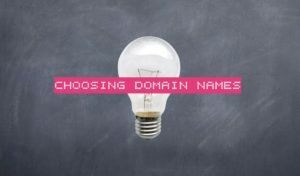 As the owner of an online store, you want to choose a domain name that relates to what you’re selling. In short, you want your domain name to give potential customers a good idea of what you have available in your store. Most shoppers want to spend as little time as possible searching for and purchasing products online. Having a domain name that is clear and simple contributes to the pleasant experience of online shoppers. You’ll want to choose a domain name that is easy for shoppers and customers to remember. Ideally, your domain name should be the one that leaps to mind whenever a shopper needs an item sold in your online store. It may be a catchy name or one that is humorous. Today, the typical shopper may have dozens of online stores that he or she visits. Registering a domain name that is easy to remember gives your online store an advantage over online store owners who have chosen complicated names. It’s important to choose a unique domain name for your online store. This means your name should not be similar to the domain names of any of your competition. You never want a shopper or potential customer to confuse your name with another online store that sells the same or similar merchandise. This is part of the reason why it’s so important to register a domain name. When you register a domain name you have sole ownership of it. Plus, a unique domain name leaves a positive impression on shoppers right from the start. Finally, once you choose a domain name, you should stick with it. Once customers start to visit your store, you can begin building a favorable reputation with them. You want to establish consistency with your customers by maintaining the same domain name from the day your store opens.